Visit the most anticipated Espirit De Noel Bazaar at A. Venue Events Hall at Makati Avenue on Nov 20 (Saturday) and November 21 (Sunday), 10:30am to 10:30pm. Enjoy up to 70% off on more than 130 brands! 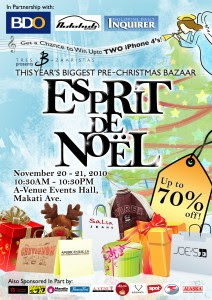 Enjoy a one of a kind of shopping experience on variety of Christmas treats and raffles of iPHONE 4 and many more!